Circle 4 at Carrowmore: The Cromleac of the Phantom Stones. This small and very beautiful dolmen is located next Site 3, directly across the road from the visitor centre. 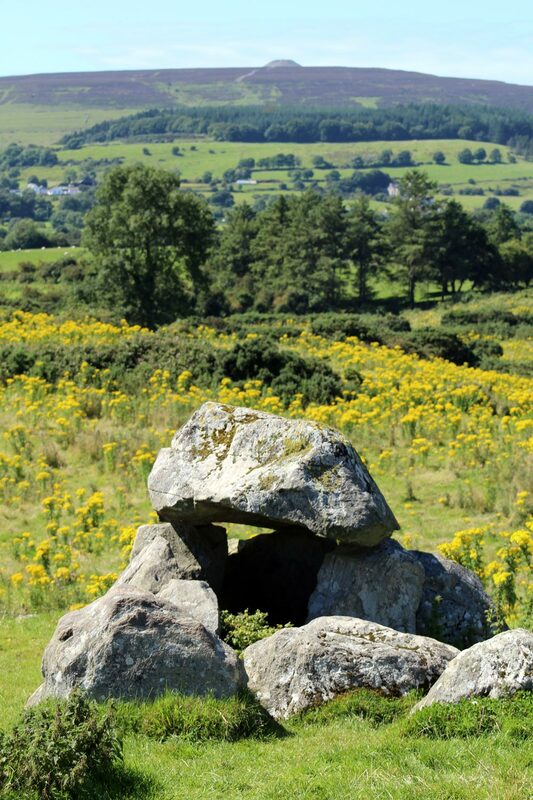 The dolmen stands at the centre of a low flat mound some 12 meters in diameter. These low platforms, tertres, are a feature of the original monuments in Brittany that the Carrowmore monuments are modelled upon. The communal burial chamber is raised above the surrounding ground level. There are remains of many such neolithic platforms in the area. 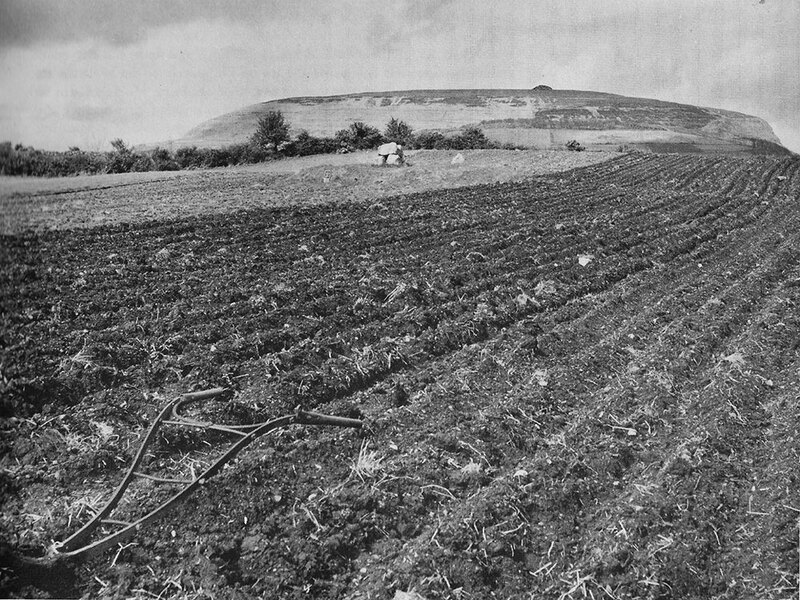 An old photo of Carrowmore 4 during some intensive ploughing in the 1970's. Photo © Michael Herity. When Petrie saw it in 1837 there was a circle of 40 stones around the mound; today there is only one remaining. Wood-Martin's excavation report is given below. He found that the floor of the chamber was flagged. About 6 kg of cremated bone was found here. Carrowmore 4. From an original sketch by Petrie. (Borlase, 1897). No. 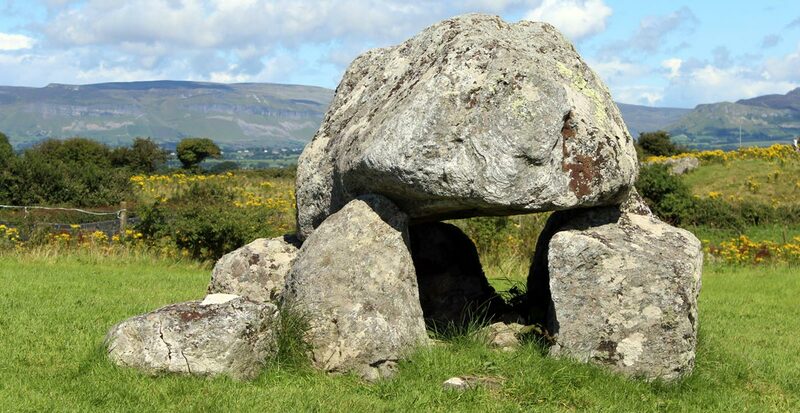 4 (dolmen-circle, a short distance to the northeast of the last). "This circle is in part destroyed, but the cromleac is untouched. The diameter of the circle is 40 feet, and the number of stones appears to have been forty, but twenty-one only remain. 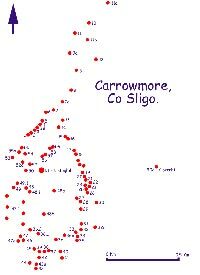 The cromleac of this circle is a good example of the size most common to such monuments in Carrowmore. It is formed of five supporting-stones, and one table-stone. It measures altogether not more than 5 feet in height, and the table-stone is 14 feet in circumference." - Petrie. View to Queen Maeve's Cairn from Circle 7 at Carrowmore. The circle had, when Col. Wood-Martin visited it, been buried by the tenant, except one boulder. On excavation, "near the surface were the unburnt remains of a wolf or dog, and of a large rodent. When the flagged floor was reached....... there were abundant traces of calcined remains, some imperfect bone pins and piercers; also a worked bone, seemingly the handle of some implement. A beautiful watercolour of the dolmen at Site 4 in Carrowmore by William Wakeman from 1879. The animal bones, of dog or wolf, and rodent, were unburnt and unpetrified, and, from their colour, had evidently lain in clay, the humus still adhering to them. There was about 14 lbs. weight of small fragments of bone, lime-soaked, and therefore much increased in weight and density. Many of them were charred and blackened by fire." - Wood Martin. 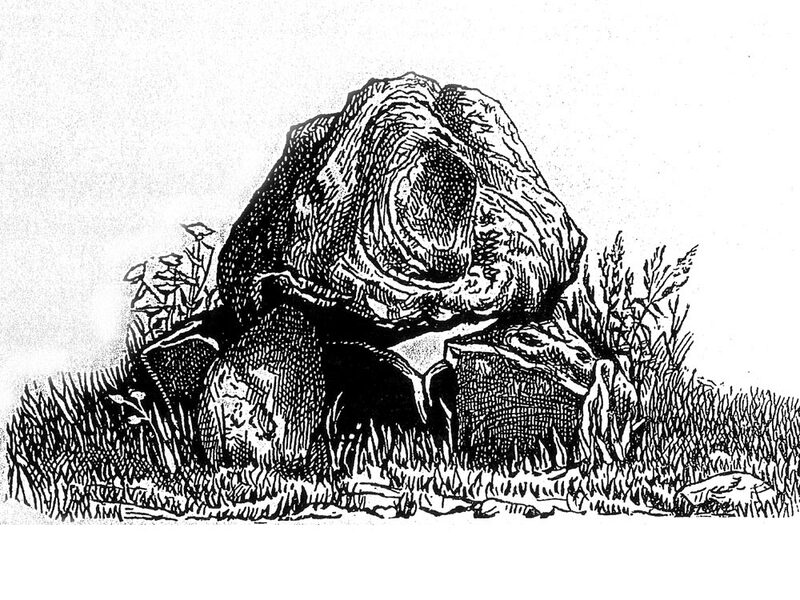 Carrowmore 4, illustration by Charles Elcock. With these remains was found a "large, roundish stone of white quartz, smooth, and weighing 14.5 ozs. It is 3 inches long, the same broad, and 1.75 inchs thick; also a smooth, black, cuneiform stone, with a thin coating of carbon, weighing 13.5 ozs., and measuring 2 11/16 inches long, 1 11/16 inch broad, and 5/8 of an inch thick; also a piece of rough white quartz of rudely triangular form, with some of its edges sharp; also some pieces of red sandstone in process of disintegration. There were also, in the general mass of small fragments, a few teeth of a young pig, bird bones, part of the valve of a shell, and half of the lower jaw of a rabbit." - Wood Martin. View of Circle 4 and The Kissing Stone with the Dartry Mountains as a backdrop.